Sumo wrestling dates back to over a millennium and is the second most popular sport in Japan right after baseball. We have all seen it at one point in our lives but how many of us really know what it’s about? Here we will learn more about sumo wrestling rules, the ranking system, training routines, famous wrestlers and tournament schedules. 1: What is sumo wrestling? 7.1: When was sumo wrestling invented? 7.2: What do sumo wrestlers wear? 7.3: What do sumo wrestlers eat? 7.4: How much do sumo wrestlers weigh? 7.5: Why do sumo wrestlers throw salt? 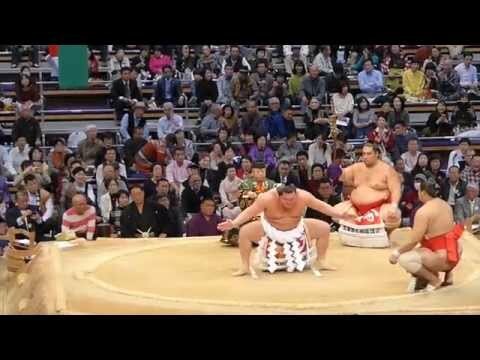 This video shows a sumo wrestling match with pre-bout rituals taken in Fukuoka during November 2015. Footage is owned and created by Ahmet Turkoglu. Sumo wrestling is an ancient full contact heavyweight sport shrouded in religious Shinto ceremonies and rituals. The Kojiki (Record of Ancient Matters) tells the story of how two gods wrestled one another for possession of the Japanese Islands and has since become a performance to entertain the various Shinto deities. It’s also the national sport of Japan and can be traced back to around 1,500 years. The rules of sumo wrestling are straightforward. The objective is to either get your opponent to touch the ground with any part of his body other than the soles of his feet or to push / throw him out of the ring. A sumo wrestler, known in Japanese as a rikishi, is allowed to grab his opponent by his mawashi belt and neck in order to get him out the ring. Slapping, pushing and tripping is permitted but fists, kicking, hair pulling and striking groin areas are not. Any such illegal moves will result in an immediate disqualification. Also, a competitor will instantly loose if his belt comes undone. Sumo wrestling rules also states that a rikishi instantly looses if he fails to show up for a match even if its because of injuries he sustained in the last bout. There are around 48 different sumo techniques one can use and 70 moves to get an opponent out the ring or onto the ground. Interestingly, there are no weight divisions so it’s common for someone to go up against a competitor twice or even sometimes three times his own weight. Therefore, each wrestler is responsible for his own weight. The more you weigh the more of an advantage you will have but it also helps to have a certain amount of agility. The dohyo is the 14.9 foot diameter square ring where a bout takes place and they are so much more interesting than your average, let’s say.. boxing ring. Dohyo’s are made from bales of rice straw covered with sand and sits on a clay base. It’s built without modern tools and instead traditional tools which have been used for centuries are used. Each ring is custom built for a tournament and at the end of a tournament serious sumo fans will take a piece of the dohyo home with them as a souvenir. Also, this may sound sexist but the dohyo is seen as a sacred place and therefore women are not allowed to touch it. In the illustration above you will see two stripes in the center of the ring. These stripes are known as shikiri-sen and indicate where each rikishi must position himself at the start of a bout. The edges around the ring are known as the ja-no-me (snake’s eye) and have a layer of sand spread over the surface area so that it’s easy to see whether or not a rikishi went out of the ring. A 6 ton tsuriyane, which resembles the roof of a Shinto shrine, is suspended above the dohyo. The tsuriyane is held up by cables but this wasn’t always the case. Up until a few decades ago it was held up by four pillars but they have been removed in order to give sumo wrestling fans a better view. However, these four pillars had significant religious meaning so to compensate for the missing pillars four purple tassels known as fusa hang from each corner of the tsuriyane. These four fusa’s represent the four spirits of directions and seasons: Winter (the black tortoise of the North), Summer (the vermilion bird of the South), Autumn (the white tiger of the West) and Spring (Azure dragon of the East). As mentioned, the sport is deeply rooted in Japanese religion, therefore before a bout each rikishi has to perform a set of Shinto rituals. Wrestlers perform their first ritual before entering the dohyo and involves taking a sip of sacred water to rinse out their mouths. Once in the ring, competitors will wipe themselves down with paper towels as a cleansing process and even throw salt onto the dohyo. The salt not only purifies the ring but also protects the rikishi from any injuries which may occur during the match. Another pre-bout ritual is when each rikishi claps his hands together. This move is to get the attention of the gods. The wrestler then extends his arms to his sides and lifts his palms upwards to show that he is not concealing any weapons. This is followed by stomping each foot hard onto the ground which symbolizes the squashing of any demons which may be lurking within the dohyo. Shikiri is probably the most interesting of all the sumo rituals. It’s when each competitor crouches in the start position and stares each other off. One would think the actual bout is about to begin but at the last second they will break their position and return to their respective corners. This can take place multiple times over a four minute period before any of the wrestlers actually engage one another. Every wrestler belongs to what is known as a stable. A stable is not only a place where training takes place but its also a community of wrestlers, referee’s, chefs and hairdressers. All training at the stables are carried out by retired sumo wrestling champions. Each stable is run by an oyakata and okamisan (stable master and his wife), who’s job is to ensure the traditions of the sport are upheld. Sumo wrestlers training at the Hakkaku stable in Tokyo. This video is from Jerome Guzzo. The training program is rigorous and demanding. The day starts 5:00 AM and the unranked wrestlers start their training first which includes leg strengthening exercises along with balance and flexibility training. Practice ends at 10:30 AM and that concludes all training for the day. Sumo stables have shower facilities for their trainees and a kitchen which serves high calorie food twice a day, once at 11:00 AM and then again at 18:00 PM. As mentioned, there are no weight divisions; however there are ranking divisions. The 6 main divisions are Jonokuchi, Jonidan, Sandanme, Makushita, Juryou and Makuuchi. The higher a rikishi moves up in the ranks the more he gets paid and the more popular he becomes with wrestling fans. Each wrestler starts from the Jonokuchi level with the intention of climbing the ranks to the top divisions. Low ranking wrestlers – which range from the Jonokuchi to Makushita levels – are largely unknown and only receive a basic allowance instead of a salary. In addition, this group is also tasked with the more undesirable duties back at the stables. For example, cleaning, cooking and serving the higher level sumo wrestlers. The group is mainly made up of new wrestlers trying to make a name for themselves and older members who used to be higher up in the ranks but after a long series of losses dropped back down to the lower levels – usually as a result of some prolonged injuries. The levels from Makushita to Juryou is the dividing line between the low and high ranks and is often seen as heaven and hell. As a matter of fact, for a sumo wrestler to make it from the bottom level to Juryou is something that can be achieved in one tournament – as long as he wins each bout. These high ranking positions are much desired because they come with fame, high salaries and more importantly – none of those undesirable chores back at the sumo stables. What follows is a list of questions about the sport of sumo wrestling. Click on any of the question below to expand the tab. When was sumo wrestling invented? No one knows for sure. The earliest written mention of the sport dates back to 712 AD, however prehistoric cave drawings have been discovered which depict sumo battles so it could be much much older than 712 AD. It’s safe to say that it’s at least 1500 to 2000 years old. The sport didn’t always exist in its current form and instead evolved over many centuries into what it is today. Also, sumo didn’t really catch on nationally until the 1600’s. What do sumo wrestlers wear? Sumo wrestlers wear what is known as a mawashi. This loin-cloth belt is worn during both training and actual tournaments. When unwrapped, the mawashi is 30 feet long and 2 feet wide. Top ranking wrestlers have mawashi made from silk and they are available in a variety of colors. Interestingly, there is a tradition among rikishi where they will have their mawashi in a specific color as a good luck charm. However, when they start loosing bouts consecutively they will consider the color of their mawashi as the cause of their loosing streak and then change colors in the hopes that their luck will change. Low ranking rikishi are restricted to using white cotton mawashi belts. The way a mawashi is tied around a wrestler can even help him with his strategy. A loosely fitted loin-cloth will make it difficult for an opponent to throw his competitor and when its fitted tightly it will be harder for the opponent to grab onto. Sumo wrestlers eat what is known as chankonabe. There is no set recipe for this uniquely Japanese stew as long as its rich in calories and protein. Each sumo stable has its own variety of chankonabe and it gets served twice a day. A wrestler will start his day training on an empty stomach and then eat large portions of this stew followed by a nap. Many of those who retired from the sport have opened restaurants specializing in their own unique variety of chankonabe. And if you ever get to watch a live sumo match at a stadium you will notice that they exclusively serve a type of chicken chankonabe because it’s believed that a rikishi should always be standing on two legs like a chicken. How much do sumo wrestlers weigh? The average competitor weighs around 326lbs (148kg). There are many who are below and above this average. Interestingly, the title of heaviest sumo wrestler goes to Yamamotoyama Ryuta who weighed a staggering 584lb (265kg). Yamamotoyama also held the title for being the heaviest person in Japan. Why do sumo wrestlers throw salt? Throwing salt onto the dohyo is a Shinto ritual which purifies the ring. It’s also believed to protect the wrestler from any injuries which may occur during the bout. There are literally hundreds of rikishi with most of them being Japanese and Mongolian. Here we will list some popular Japanese wrestlers from the past and present. Chiyonofuji Mitsugu was born as Mitsugu Akimoto on June 1, 1955 in the town of Fukushima, Hokkaido. He started his career as a sumo wrestler in September, 1970 and reached the top of the sumo ranks 11 years later in July, 1981. He was a member of the Kokonoe stable in Tokyo and had an average weight of 280lb (127kg) during his wrestling years. Chiyonofuji also won 31 tournaments and was well known for his technique and fighting spirit. He retired from the ring in May, 1991 and passed away from cancer on July 31, 2016. Goeido Gotaro was born as Sawai Gotaro on April 6, 1986 in Osaka, Japan. He has been practicing wrestling since his first day of primary school and started competing professionally in January, 2005. Goeido weighs 355lb (161kg), is a member of the Sakaigawa stable and reached the top of the ranks in September, 2014. He is well known for his techniques which consists mostly of grappling and neck-throwing as opposed to pushing. He is still an active wrestler and continues to compete to this day. Kotoshogiku Kazuhiro was born as Kazuhiro Kikutsugi on 30 January 1984 in Yanagawa city. He entered the world of wrestling in 2002 and made his way to the top ranks a mere 3 years later in 2005. Kotoshogiku is a member of the Sadogatake stable in Matsudo City, Chiba prefecture. In 2011 he competed in 3 tournaments and won 33 bouts for which he was promoted by the Japan Sumo Association. Additionally, in 2016 he became the first Japanese born wrestler in ten years to win a top-division tournament. Wakanohana Masaru was born as Masaru Hanada on January 20, 1971 in Suginami, Tokyo. His weight was 295lbs (134kg) and belonged to the Futagoyama stable. He made his sumo wrestling debut in March, 1988 only to reach the top of the ranks 11 years later in May, 1998. Wakanohana won numerous tournaments and retired in March, 2000. Since his retirement he has served as an elder of the Japan Sumo Association, worked as an entertainer within Japan, played American football for the Arizona Rattlers and is currently owner of numerous chankonabe restaurants. Yamamotoyama Ryuta, simply nicknamed Yama, was born May 8, 1984 in Saitama, Japan. At the height of his career he weighed an incredible 584lb (265kg), which made him not only the heaviest sumo wrestler in history but also the heaviest person in Japan. Yama made his wrestling debut in January 2007, reached the highest ranks in May, 2009 and then retired in April, 2011. He didn’t retire out of free will though, but was pressured to do so by the Japan Sumo Association after allegations emerged of him rigging matches. Since his retirement he did a sumo and sushi tour of the US and starred in India’s biggest reality show – Bigg Boss. There are 6 grand tournaments held across Japan each year. Each tournament starts and ends on a Sunday and lasts 15 days each. Three of the six yearly tournaments are held in Tokyo and one tournament each for Osaka, Nagoya and Fukuoka. In the table below is the grand sumo tournament schedule for 2019. Banzuke: A banzuke is a list of competing wrestlers listed according to their current rank for an upcoming grand tournament. Basho: A basho is a tournament or the venue where a tournament will be held. Chankonabe: Chankonabe is the main diet of wrestlers. It’s a high protein stew which wrestlers eat in large quantities to help them gain weight. Chonmage: Have you ever wondered what the hairstyle wrestlers have is called? That topknot hairstyle is called a chonmage. The hairstyle has only fairly recently become popular with sumo wrestlers. It was first popularized during the Edo Period where it was mostly worn by samurai’s. Dohyo: A dohyo is the ring where a bout takes place. Gyoji: A gyoji is a professional sumo referee. Hikiwake: A hikiwake is a draw. It’s uncommon in the modern-era but happened frequently in the old days. Nihon Sumo Kyokai: The Japanese name for the governing body of professional sumo – the Japan Sumo Association. Rikishi: The word rikishi directly translates to ‘powerful man’ and refers to a sumo wrestler. Shikiri-sen: Shikiri-sen are the two white lines you see in the dohyo which indicates each competitor’s starting position. Ever wanted to watch a live sumo wrestling match in Tokyo? Find out here..
Eat like a sumo wrestler at any of these chakonabe restaurants in Tokyo..
Sumo is deeply rooted in Shintoism – the national religion of Japan..
Are you interested in watching sumo wrestling in Japan? Get your tickets from the Japan Sumo Association here or from buysumotickets.com here.